Bahrain claims that Hizbullah is behing five bombings that killed two Asian expatriates in the capital Manama. 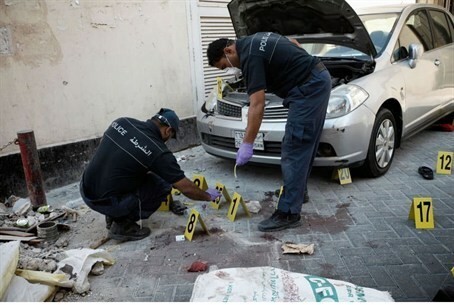 Bahraini police on Tuesday arrested four suspects in connection with bombings that killed two Asian expatriates in the capital Manama and fingered the Hizbullah terror group as being behind the attacks. The official BNA news agency reported about the arrests but did not elaborate on when or how they were made. "An investigation is under way to uncover the circumstances surrounding these terrorist crimes and identify the rest of the criminals and arrest them," BNA quoted public security chief Major-General Tariq al-Hassan as saying, according to AFP. The report came hours after King Hamad ordered "the swift arrest of the terrorists who carried out the recent terrorist acts in Bahrain." The king appealed to the public for help to "bring them to justice so they receive their punishment over this appalling act." Five bomb blasts in the capital's Gudaibiya and Adliya districts killed two Asian expatriates and wounded a third on Monday, police said, according to AFP. The bombings came amid persistent tensions between the kingdom's Shiite majority and its Sunni rulers since the bloody crushing of month-long pro-democracy protests in March of last year. Meanwhile, Kol Yisrael radio reported on Tuesday, Bahrain placed the blame for the bomb attacks on the Lebanon-based Hizbullah terror group. The report quoted Bahrain’s Public Diplomacy Minister, Samira Ibrahim bin-Rajab, as having said that the attacks were reminiscent of Hizbullah attacks. She added that the terrorists who carried out the attacks were trained in other countries, including Lebanon, following a directive by the Iranian Supreme Leader, Ayatollah Ali Khamenei. Bahrain has accused Tehran several times in the past of encouraging the opposition in Manama. Iran and Hizbullah have denied any involvement in the protests in Bahrain. The United Nations on Tuesday condemned the bombings. "These violent acts cannot be justified by any cause. We call on all concerned to exercise maximum restraint and to refrain from any provocations," said UN spokesman Martin Nesirky, according to AFP. "We urge all Bahrainis to come together in a spirit of national unity and to resolve differences peacefully through dialogue and reconciliation," he said.